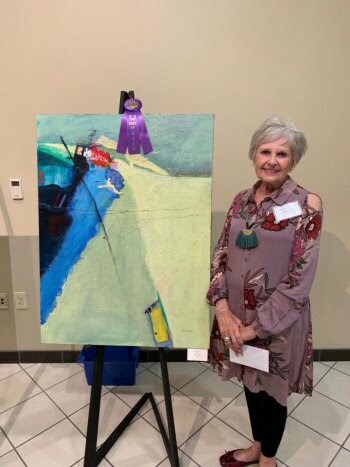 Three AARS members received awards for their paintings at the North Augusta Artist Guilds's fall exhibition, "Fall into Art", held at the Arts and Heritage Center of North Augusta November 8, 2018. 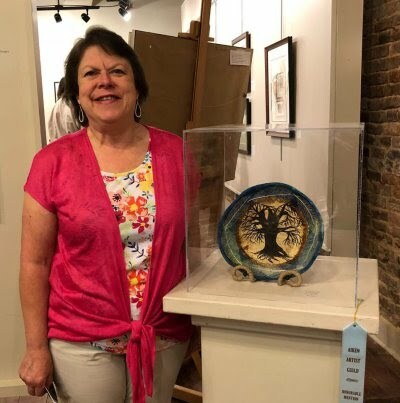 At the South Carolina State Fair Fine Arts Exhibition in October, 2018, Donna Minor won Second Place in the Open Media Category for her piece, "Just Dreaming." 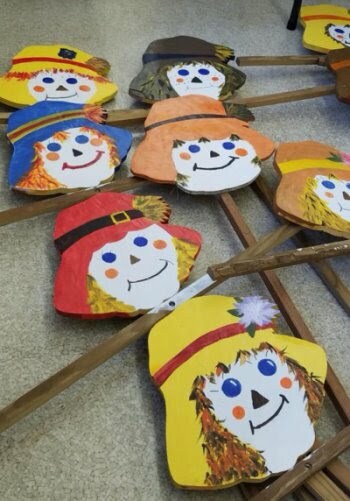 Donna Minor and "Just Dreaming"
The scarecrows are coming to life for the October Ridge Spring Harvest Festival, expertly painted by AARS Artists. 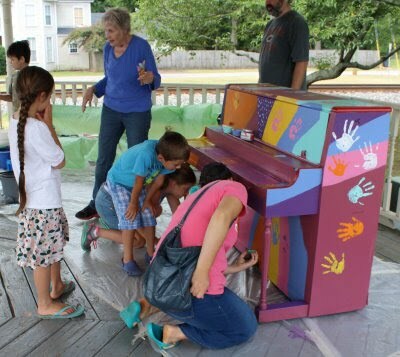 July 14, the Art Association of Ridge Spring held a paint party at the Town gazebo to decorate a piano. Thanks to all the children in the community who came and did their bit to create a memory for the Town. The piano remains at the gazebo for anyone to play whenever they feel inspired to make music. 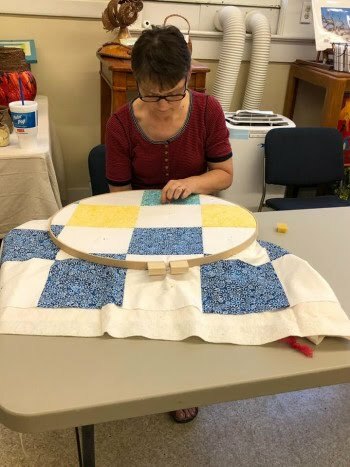 Quilting at the Art Center this year is multifaceted, including fabric quilting for beginners, painting quilt patterns on platters, painting quilt boards for the Ridge Heritage Quilt Trail, and raffling off a fabric quilt as a part of the Town's first Quilting on the Ridge Event. We had a group from North Trenholm Church on Saturday, May 5. Barbara Yon spoke to the group about the quilt block trail in our area. The group also visited Saluda and Ridge Spring and ate lunch at Juniper. 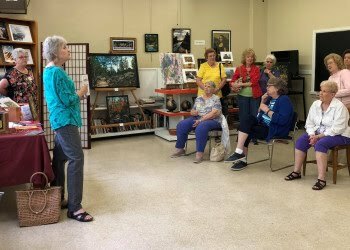 On May 10, Barbara Yon hosted members of the Ridge Spring Woman's Club, also talking with them about the quilt block trail. Mary Ann Roever of Wagner has completed teaching the first 5 sessions for beginning quilters. 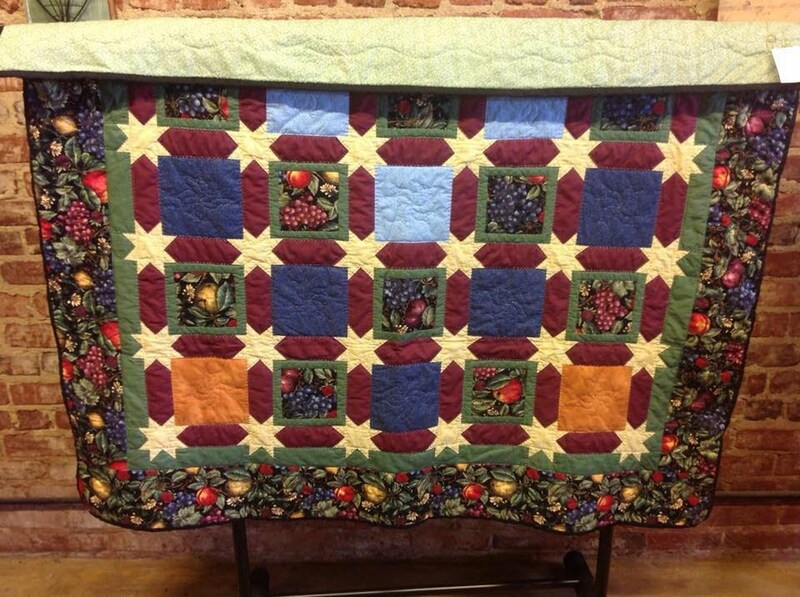 Hand and machine quilting were included in the 10 hours of instruction that began April 9. 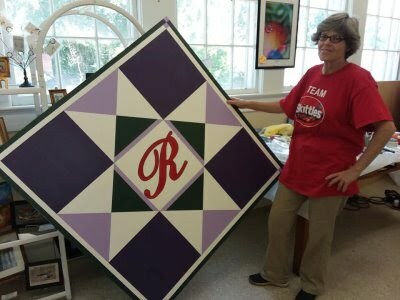 On Saturday, March 10, Mayor Pat Asbill officiated the drawing for this beautiful quilt, made by Anne Curley. Kathy Hutchinson won the quilt. Barbara Yon led a workshop, where participants learned how to design and paint quilt patterns on wood. 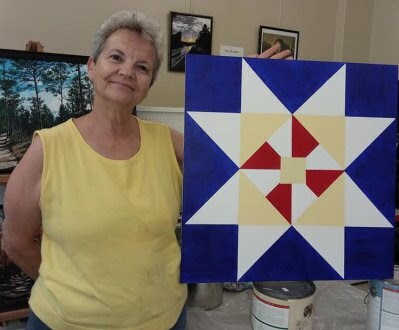 Both events were held at the Art Center of Ridge Spring as a part of the Town's first year of Quilting on the Ridge, held March 9 and 10. 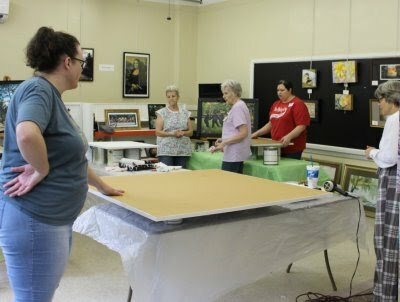 May 19, Barbara Yon held another quilt block painting workshop. When completed, these five new quilt blocks will be added to the Ridge Heritage Quilt Trail. 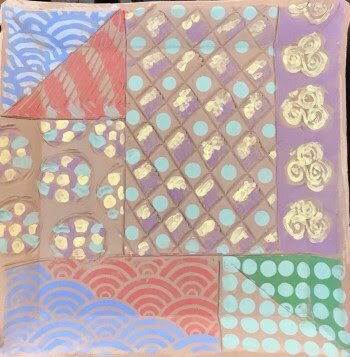 The second class in Kim Ruff's 2018 pottery series, held February 12, featured a quilt patch platter to commemorate the quilt emphasis. Quilt designs were painted on the platters with underglazes. Six little artists from the Girl Scout Troop 1900 from Edgefield painted gourds at the Art Center March 1. 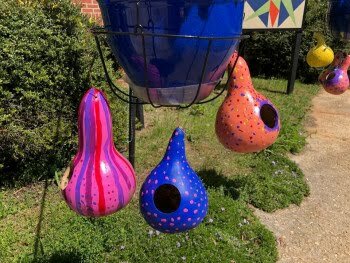 The gourds for this project were donated by a gourd farmer in North Carolina. Be on the lookout for these creations around town. Pick up your quilt trail map at the Art Center. Asbill Family, located at the entrance on highway 392. Unless otherwise noted, all events are located at the Art Center. These events are open to both members and the general public. Gallery hours in March are 10:00 a.m. till 2:00 p.m. on Fridays and Saturdays. Quilting on the Ridge, March 8 and 9. Start at the Art Center. Contact Joanne Crouch to register at joanne.crouch26@gmail.com. Fall Decor Gourd Art Sept 25th @ 6:00- Create a pumpkin (gourd) that will be part of your fall décor for many years to come. This is for ages 10 & up. Costs will be $30 which includes all supplies. Contact Joanne Crouch at joanne.crouch26@gmail.com to register. Mosaic On Sept29th at 8:30, Barbara Yon and members of AARS will demonstrate the basics of mosaics. Students will apply cut glass to the risers of the steps at the Art Center. There is no charge for this event. Contact Barbara Yon atbyonart@yahoo.com or a member of the AARS if you would like to participate in this event. Paint Ball Stomp, Saturday, October 13, 12:30 p.m. at Ridge Spring Harvest Festival. 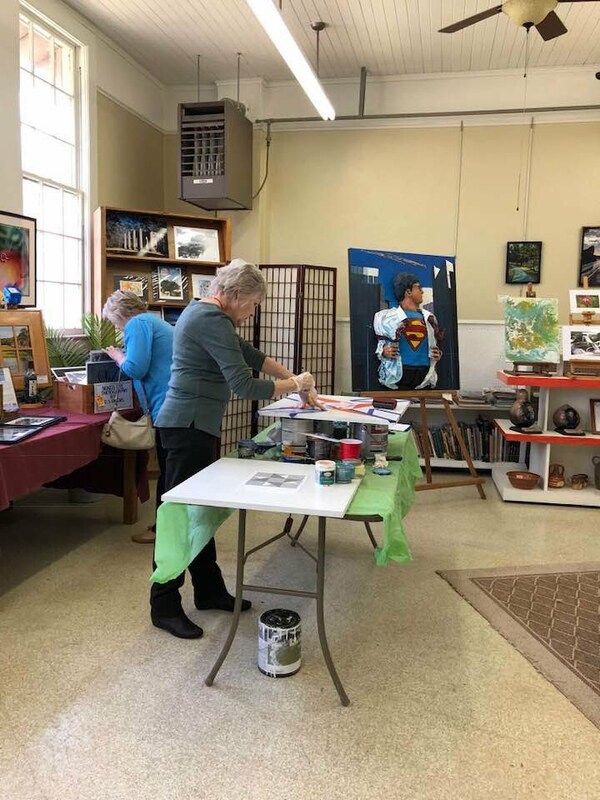 Participate in an artistic community event. Festival goers will help design an artistic piece by throwing Goblies (paintballs) at a large prepped canvas with the town logo on it. Don’t let this opportunity pass you by. Mayor Pat Asbill will throw out the first ceremonial pitch of the paintballs. Pottery Kim Ruff, instructor On October 15, a clay Christmas tree class will be held on Monday, Oct15th from 6:30-8:30. Cost is $35 and includes all firing and glazing. Kim’s class will allow the students to make additional small pieces to use all the clay that is allotted for the class. Contact Kim Ruff at makerart@aol.com or Joanne Crouch at joanne.crouch26@gmail.com to register. .Stained Glass Vernon Robinson, instructor-October 19th and 20th 10-4. Students will make a 8 x 10 suncatcher. Mr. Robinson is very crafted in his skills. Class will be very small so spots are limited. Cost is $250 with ½ will need to be paid when participant signs up. Contact AARS or contact kedrynevans@gmail.com , (910)583-2219 or Vernon Robinson (803)640-4527 for details of how to become a part of this class. November 17, Acrylic Paint Pour class, Carolyn Boatwright, instructor. Students in Barbara Yon's workshop series completed these quilt boards in June. 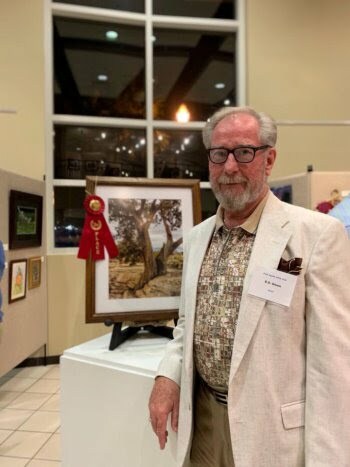 Ron Buttler received three awards at the Aiken Artist Guild Member Show May 10, 2018. "Food Lion" earned him awards for Best Aiken Scene and Judge's Choice. "The Pond" earned him first place in the Scenic category. Donna Minor won second place in the Contemporary category for "Crystal Creek." 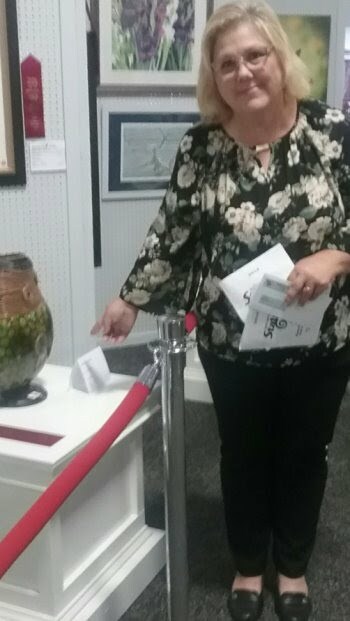 Joanne Crouch received an honorable mention for her gourd piece, entitled "Tree Life. In April, the Dogwood Festival in Denmark awarded Ron Buttler second place in painting and D. S. Owens third place in photography. Also in April the Spring Fest Show at the North Augusta Art Center gave D. S. Owens honorable mention for his photography. 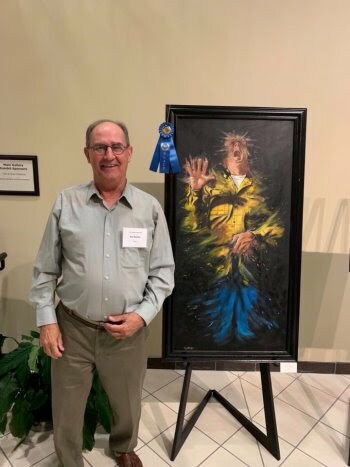 In June, Ron Buttler won third place for "Beauty and the Beast" at the Juried Exhibit at the North Augusta Arts and Heritage Center. 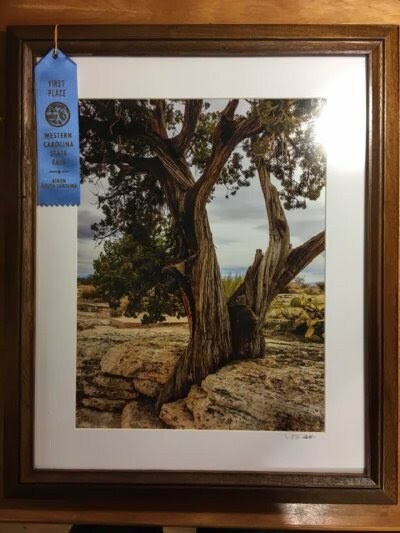 In October, 2017, D. S. Owens took first place in the scenic fine art category for his photograph, "Between a Rock and a Hard Place." Our mission: Give our community opportunities to enjoy, create and market art. Our vision: Ridge Spring will be a mecca for people who create, enjoy and buy art. Our citizens will enjoy the cultural and economic benefits of a thriving art community.